TIME & MONEY SAVING with car dent kit remover:Dents in your automobile are unsightly and potentially represent a high cost, whether for the repair itself or the loss of resale value. DIY paintless dent removal can save you much of the cost and bother that can come after a minor accident. 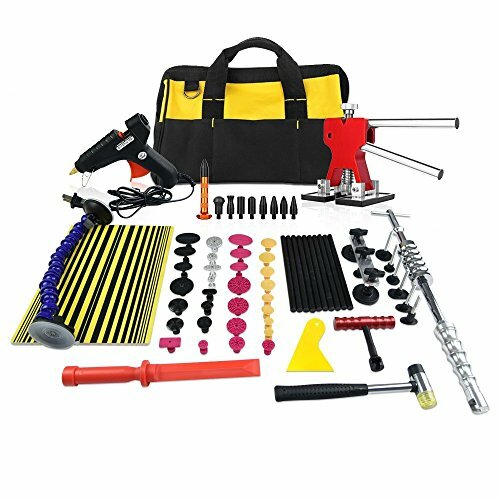 ALL IN ONE:This PDR Dent kit includes all of the necessary PDR dent pulling tabs, glue sticks and puller slider hammer accessories for removing every type of dent.Preferred by body shops, and PDR professionals and DIY'ers. NOTE:Auto body dent puller /Glue pullers work best on shallow dents and pliable areas that have more flex.These are best used when the original paint of the car is not damaged.Very deep dents may not come out all the way and may require a much more experienced pdr tech to remove them with good results. BUY with CONFIDENCE: We are experienced dent removal tool manufacturer with years of PDR tool production experience.All items are under through strict inspected and certified before shipped out.